Hey!! 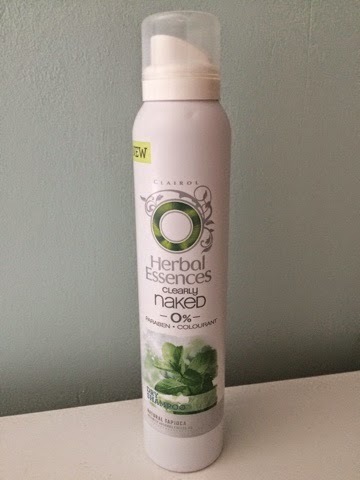 So all weekend I've been revising for my two English literature exams this week but I didn't want to go a week without posting to I'm just gonna do a quick review/rant of Herbal Essence Naked Dry Shampoo. I was really looking forward to trying this as I've loved Herbal Essence products in the past. Also, it was a dry shampoo that didn't leave white residue, I was so looking forward to trying it! My first thoughts were that it smelt nice and it was affordable. However, it was very similar to hair spray. When you sprayed it you could see the water droplets in your hair which is not what you want as the purpose is to make your hair look dry and non-greasy. It then made my hair sticky and crispy just like a cheap hair spray does. The next day I then used it again but a smaller amount as I thought I'd just applied to much. I still had the same outcome. It didn't leave my hair looking fresh and defiantly isn't a substitute for a hair wash! I get to school and the whole bottle had leaked in my bag. It was two days old, the lid was on and it was more or less full! I went to Superdrug and they kindly replaced it straight away for free as they said it must be a faulty bottle. This time I didn't take the dry shampoo with me to school and I kept it on my dressing table at home. I return home that day with the spray button not working. It would push down with nothing coming out. I think it was the liquid, due to it being like hair spray, had sealed the hole. I then went back to it today (about a month later) and there's only a tiny bit left; It's as if the contents had dried up! My friend also said she's had the same problem with it leaking and the hair going 'crispy' so I wouldn't recommend it. Batistse Dry Shampoo is still my number 1 however if you have any dry shampoos that are clear please comment below because I'm still on the search! Thankyou for reading my review/rant!